Here at Peninsula Speech Pathology Services, we all have a favourite app or two that we use regularly with the kids. One of my favourite series of apps is from Toca Boca. These are a range of apps that depict everyday activities, such as going to the doctor, having a hair cut or having a tea party. With Toca Tea Party (my personal favourite) you can grab a couple of friends and sit down to a tea party, complete with candles, fancy table cloths and music. In therapy, I like to use this app to target “I want”, “more” or “he” and “she”. You can also use it to target verbs, such as “eat”, “drink”, ” spilt”, “clean”, and “blow”. You can choose the tablecloth, plates, food and drinks, therefore working on vocabulary. You can change the music and blow out the candles. The kids find it hilarious when you knock over your drink and have to clean it up with a tissue. At the end, you have to do the dishes! I have yet to meet a child (or a parent) that does not like to have a tea party. The kids also like Toca Kitchen and Toca Kitchen Monsters. They get to feed either an animal or a monster. Again this can be used to target verbs such as “cook”, “cut”, “eat” and “want”. It can also be used as a vocabulary task to label the food items or the kitchen appliances. The animals and the monsters change their facial expressions and occasionally will refuse to eat the food if they don’t like it! Another in the Toca Boca series is the Toca Hair Salon (4 different versions), where you can give a range of characters hair cuts. The children love to wash the hair, cut it, colour it and style it. Again the characters change their facial expressions to indicate if they like it or not! This app can be used for many ways in therapy, including targeting verbs, colours and following directions. 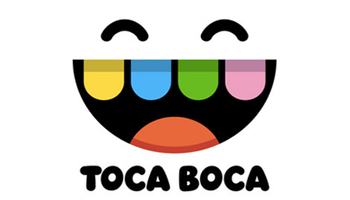 These are just a selection of the Toca Boca apps that are available and they can all be used in many ways. Speak to your Speech Pathologist if you would like some more ideas on how to use these apps, but I would just have a play and have some fun! Be creative in what you can target when using each app!